Welcome to the Metorex Group Human capital website. Human Capital bases its foundation on the Metorex strategy which defines the Vision and Values of the organisation which is enabled through the Strategic Anchors defined for the organisation. As a newly established Human Capital team, our focus is to align the entire human capital function with the greater Metorex Strategy and add value to our business. 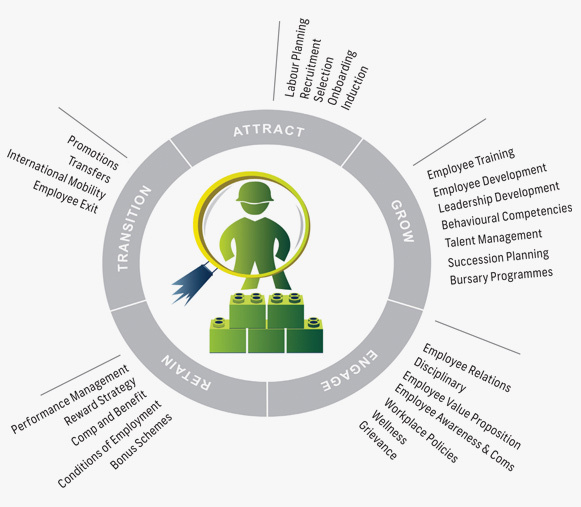 The employee life cycle is a model that identifies stages in employees’ careers to help guide their management and optimize associated processes. It is the framework for evaluating the entire employee experience. And provides a holistic view of all people processes and moves people processes from single processes to the overall journey of employee through their career.